Baccarat, or punto banco, has a reputation as a game for high rollers. 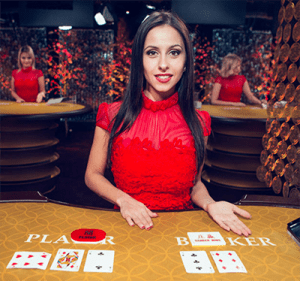 Online baccarat is becoming hugely popular with players of all bankrolls, especially live dealer baccarat – we explain what live dealer baccarat is and where you can play for real money at the best online casinos. If you are not familiar with baccarat, it is a sophisticated card game often described as a glorified coin toss. The player puts a wager on whether the player or banker will end up with a higher score, or whether the deal will result in a tie. While the rules can seem a bit complicated to newbies, no particular skill or strategy is required to play as baccarat is a game based purely on chance. You can read our detailed guide to find more about the rules of baccarat and where to play online. Live dealer baccarat combines the excitement of gambling in a land based casino with the comfort and convenience of online play. Games are hosted by real people who have been professionally trained to the highest standards, and take place in high-end casino studios made to replicate the VIP rooms of bricks and mortar casinos (some, like Playtech’s live dealer games, are even hosted from famous casinos like the Mayfair in London). Live video feeds are used so you can stream the game to your computer or mobile device in real-time, just as though you were there in real life. As the player, you get to place bets in complete privacy using your mouse or touch screen, while watching as the dealer calls for bets, deals cards and announces the results. Live dealer play combines the comfort of online play, with the social elements of spending time in a casino. As baccarat is often viewed as a game exclusively for high-rollers, the more casual player will be pleased to know that live dealer baccarat has more affordable betting limits than you’d find from a land based casino. Live dealer games have become incredibly popular with online players, with a majority of all leading web-based casinos now offering some form of live dealer software. 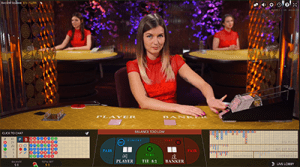 Typically, if live dealer software is available, at least a couple of baccarat tables will be on offer, with different betting limits to suit recreational players and high rollers. The live dealer baccarat sites available will depend on which country you’re playing from, as every country has different laws surrounding online gambling. For a list of the best live dealer baccarat casinos catering to players from your country, refer to the casino tables on our page. These have been geo-targeted to recognise your region and only recommend online casinos that accept players from your country. Sign up using our links in these tables to get an exclusive welcome bonuses to kick start your live dealer baccarat experience. We recommend the use of a trusted VPN (virtual private network) for an extra layer of security when gambling for real money online. Our recommended casinos are all licensed, regulated and protected by a minimum of 128 Bit SSL (Secure Socket Layer) digital encryption, but the added protection of a VPN can provide further peace of mind. Unlike standard RNG (random number generated) baccarat games which can be sampled for free, playing against a live dealer requires a real money wager to be placed. Live games are powered using sophisticated technology, highly advanced software and professional dealers, so the game studios need to make sure they recoup their costs. To play live dealer baccarat for real money, head to one of the top-rated casino sites in our table above and sign up for an account. Make an instant deposit using a trusted payment method like Visa, MasterCard, Neteller, Skrill, Paysafecard or direct bank transfer and head to the live dealer section. You’ll then be logged into the live dealer game lobby where you’ll see all the live baccarat tables that are currently open, complete with their minimum and maximum betting limits. Click to enter the baccarat table of your choice, use the buttons at the bottom of the screen to place your bets and then watch as the dealer deals the cards and see if the win goes to player, banker or tie. If you’re lucky enough to bet on a winning result, your winnings will automatically go into your casino account. Follow the dealers prompts to bet again, or leave the game at any time. Some live baccarat games will also give you the option of chatting with the dealer or other players if you would like to keep things social. What live dealer baccarat games are available online? Some of these games offer side bets, like Player Pair, Banker Pair, Player Bonus, Banker Bonus, Either Pair, Perfect Pairs, Natural Win, Winning Total and Ante/Wager. Side bets are completely optional and require an additional wager. Side bets aren’t available in all live baccarat software, with different licenses provided to different casino vendors, so you will need to check if your chosen live baccarat studio offers side bets. Despite what some punto banco enthusiasts may try to tell you, baccarat is purely a game of chance – the results are entirely based on luck and there’s nothing a player can do to influence the outcome of a game. Avoid anyone who tries to bestow baccarat strategy upon you, especially if they’re charging you for the service, as no winning baccarat strategy exists. When playing live dealer baccarat, the best thing you can do if make sure you understand the rules of the game and familiarise yourself with game play before you dive right in. The best way to get your head around how baccarat works and the odds of winning is to try computerised games for free in practice mode at our recommended online casinos. The top-rated casino sites offer plenty of RNG (random number generated) baccarat and punto banco variants which are available with no downloads required, so you see for yourself just how luck-based this game is. Once you feel completely comfortable with the online play format, then it’s time to make a real money deposit and play live dealer baccarat against a real person. For a list of the top-rated online casinos offering live dealer baccarat games to players from your country, refer to our casino table at the top of this page.